Chap comes with loads of built-in shortcodes to use. But typing the shortcodes out manually can be tedious or you may not know how to properly combine them. For that reason there are also composites which are combinations of various shortcodes to produce a good-looking UI element or a whole page. The Shortcode button allows to insert any shortcode. Some of them also have presets. The Composite button allows to insert a whole collection of shortcodes. The composites come with descriptive pictures so you know what you’re getting. If you would like to keep the indentation of the shortcodes in the editor, then avoid switching to the Visual editor. Page composites are designed to be a layout and UI elements for a full page. Some of the composites come with a mix of multiple different UI elements that could display similar content, so preferred style can be chosen and rest discarded. Slide composites are designed as slides for the Chap main slider, responsive down to mobile screen size (assuming default slider dimension settings). 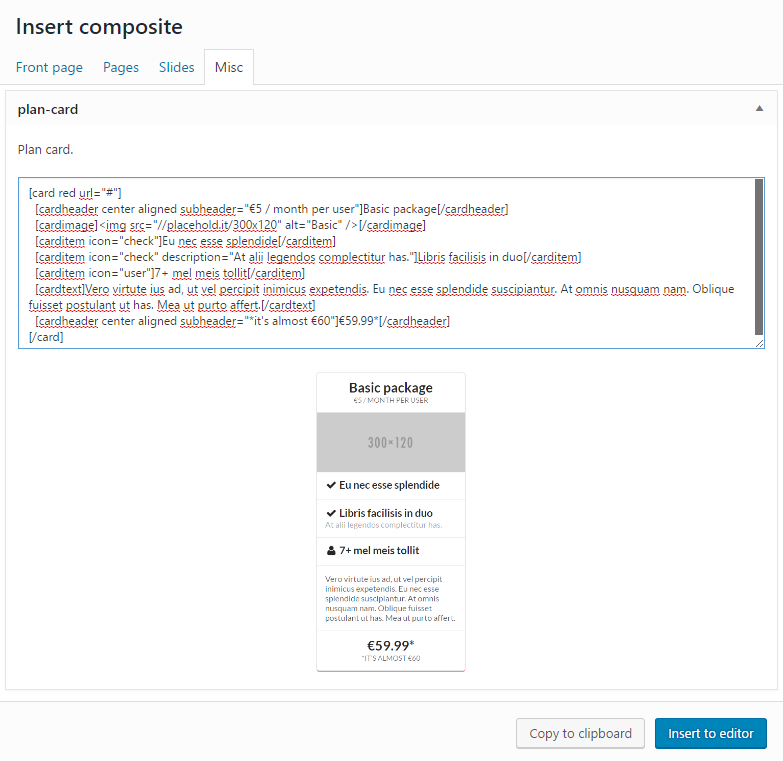 Composites listed under the Front page tab can be used to create user interface for landing pages. They are designed to be used on a pages with Full width page template, which can be chosen on the right, from the Page Attributes metabox. Front page composites are typically wrapped in an .ui.vertical.stripe.segment, as well as .ui.container to contain the contents to a reasonable maximum width (since a Full width page template does not do that automatically, to allow the background color of stripe segments to span the entire width of the page). Vertical stripe segments provide increased font size, background, padding as well as a border separating them from each other. Vertical stripe segment's padding can be modified using very tight, tight, padded and very padded keyword classes. Vertical stripe segment's separating border can be omitted by using the borderless class. Standard segment size modifiers, such as mini, tiny, small, medium, large, bug, huge and massive can be applied. Standard segment color modifiers can be used.